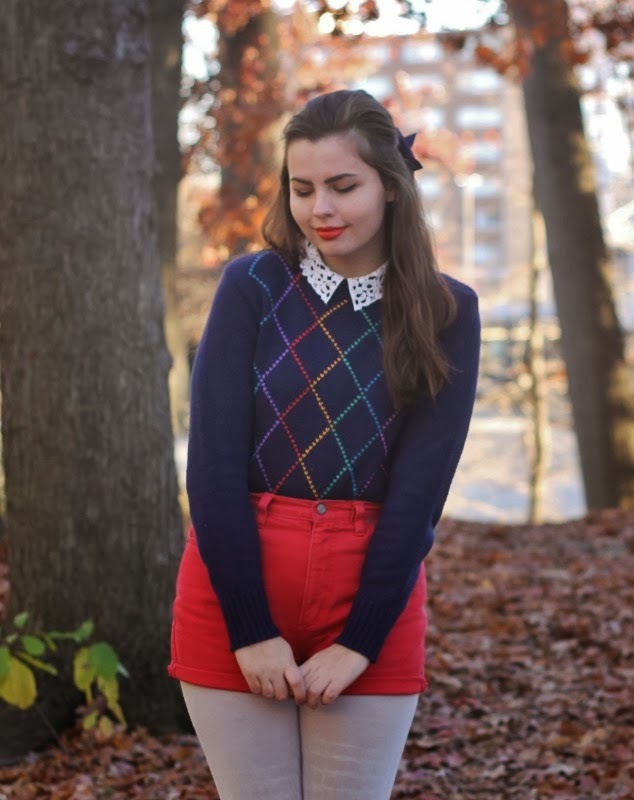 Heart Sweater, Red High Waisted Shorts, Hair Bow: Thrifted. 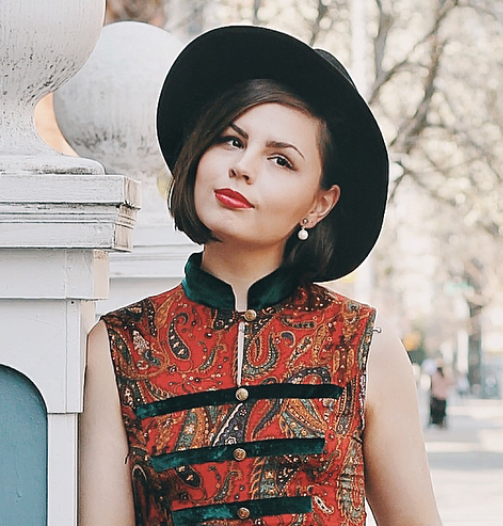 Cut Out Blouse (worn underneath): Forever21. I woke up this morning (ahem, more like afternoon) and was so elated to see that I had hit OVER 1,000 followers via Google Friend Connect! In the big scheme of things, blogging isn't about the followers and how many you have. Blogging should be about posting what makes you happy for you--not for others. But the fact that over 1,000 people follow this blog...it blows.me.away. When I first started this blog I dreamed of having 1,000 followers, but it felt like it would never happen. When you're stuck at 58 followers for a good six months 1k seems pretty far away, hah. It is hard for me to wrap my mind around that number of people that follow me. On my twitter the other day I posted that I had hit over 750,000 total page views. That number is terrifying to me that my blog has been looked at that many times. I guess I just don't understand...why? In my eyes I am nothing special. It's not a low self-esteem thing or even being humble. I'm just this ordinary midwest girl who's in college and wears clothing? What's so special about that? When reading through the comments of my 4 year blog anniversary I was just so overwhelmed with gratitude that you all take the time out of your busy lives to read about mine, see how I'm doing, and support and encourage me on. Blows me out of the water, really. That I'm some of you guy's favorite blog...? Like, what have I done to deserve that honor?! Honestly nothing. I'm just lucky to have over 1,000 people and more who, even though I am just me... that's enough for them. Forever thankful and forever grateful. I was just thinking that 1,000 is such a huge, important milestone that I want to draw TWO winners for the MAC lipstick giveaway. One in celebration for four years and one in celebration for 1,000 followers. I feel like it's only a right way to say thank you Now if I could only buy all of you a MAC lipstick but that'd be ohh... 1,002 x 15 = $15,032. I think I need that for my tuition haha. You've been reaching one milestone after another lately, dear Lauren. Congratulations on hitting 1,000 subscribers. No one deserves it more than someone like you! You totally deserve this Lauren. As I said on Instagram the other day, you're my favourite blog hands down as you're such a kind, down to earth person who takes her time to actually speak to the people who support her which I find so lovely because not many bigger bloggers bother with that anymore. You're always there and I know that if I need advice then I can drop you a twitter message and you'll reply with a super helpful and personal answer that makes me feel special as you took your time to read and write a lovely and lengthy reply! Hey lovely!!! That's a wonderful achievement! But we need more lovely, genuine young people out there as role models! I'd love to enter your giveaway but I don't really wear lipstick so I'll make the probability higher for someone else by not entering!! But that's a lovely generous gift for someone! Wooo! Congratulations on such a big milestone. People flock here because you have such a cute style, pretty pictures, and really candid, truthful writing style. You're awesome! P.S. This outfit is just so so cute. I love this sweater you thrifted. Pairing it with red shorts was a fantastic idea! I first saw you in this month's Seventeen magazine and realized "Wow, her and I are the same body shape" so I decided to check out your blog. I hope you don't find this creepy, but I think I've gone through your whole entire blog. Needless to say, I'm obsessed with your style. And because I have gone through most of your blog, I decided to start one of my own! I'm really excited and I just wanted to say a big CONGRATS on you reaching 1,000 followers! Hope you have a lovely rest of the week! First of all, you have AMAZING style, so you totally deserve 1,000 followers. Second, even without the style, you seem like such a sweet person. you really deserve it. And thank you for that sweet giveaway! Congrats Lauren! That is so exciting! The reason you have so many followers is because you're such a sweetheart! Congratulations! What a fantastic achievement! Congrats!! That's amazing! You deserve it! Love your outfit, by the by! You look so cute! 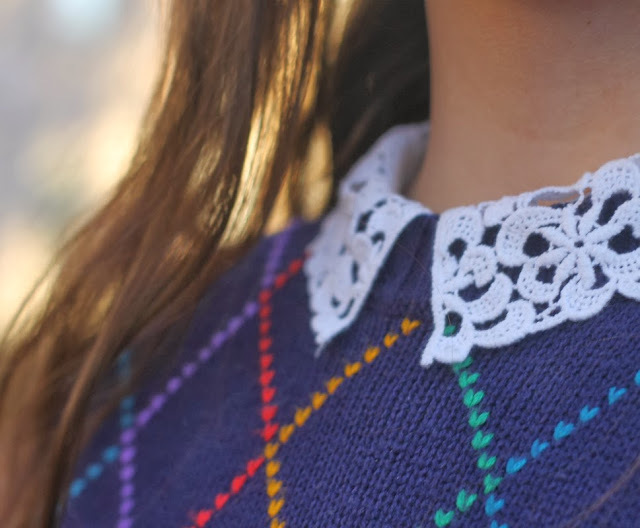 Love the little lace detailed collar! Gorgeous. Congrats on all the followers! You should be very proud you have content that people feel strongly about and respond to! … so very stylish, I love the look…..it is so chic….. the lovely red shorts and that adorable sweater……, .. …………love you in the white tights ...no one wears white tights better than you do..... I've always loved white myself...goes back to the days when I was a teen and begged my ballet teacher to let me wear white tights instead of black for my classes........ I have worn shorts or big shirts and sweaters with tights on campus all fall…… obviously like you…. So cute! 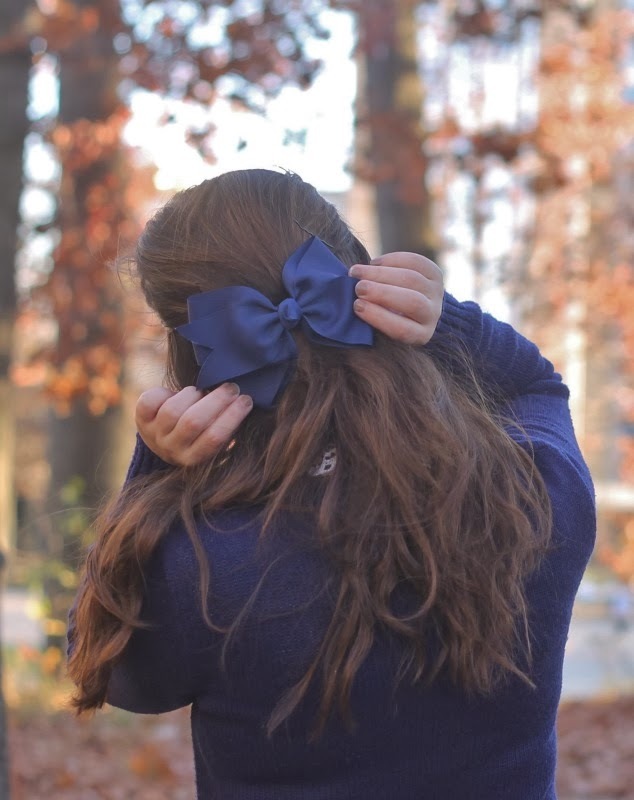 Love the bow :) It's so amazing to see who your style has progressed from year to year and how passionate you are about what you do. It's truly inspiring. Congrats on 1000!! That's huge! :) You just have awesome style that's why ;) Love this sweater/collar combo and your gorgeous hair! !